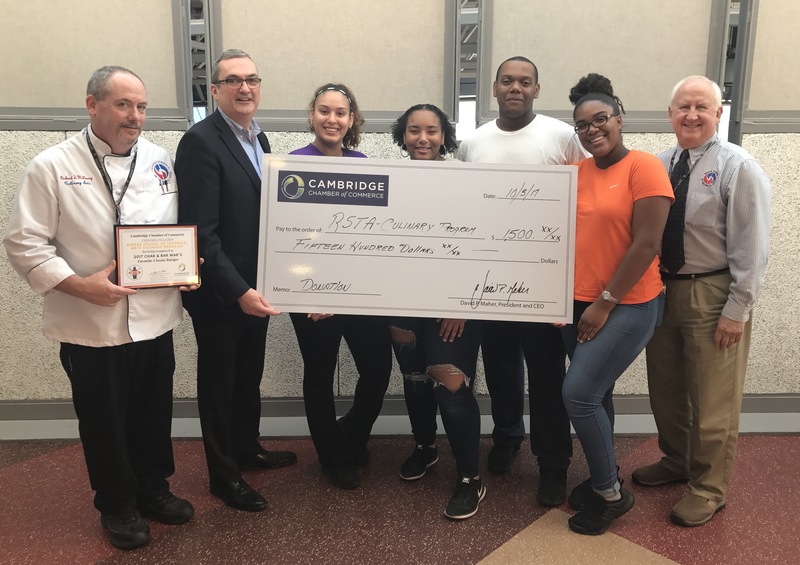 RSTA Culinary Arts & Hospitality Program awarded $1,500 from Cambridge Chamber of Commerce. On August 2nd, 2017 the Cambridge Chamber of Commerce hosted the first annual Char & Bar Wars, a burger and bartender battle. The event showcased 16 Cambridge restaurants in a friendly competition for the Favorite Classic burger, Signature Burger and Summer Cocktail. Winners were selected by people’s choice, as all attendees voted on their favorite vendors to determine the winners. In addition to featuring restaurants, the Chamber invited the Rindge School of Technical Art’s (RSTA) Culinary Arts and Hospitality’s Program students to compete in the burger battle. Not only did they compete, they earned the most votes and won the “Favorite Classic Burger” category! The Chamber also selected the RSTA Culinary Arts and Hospitality Program as the beneficiary of the inaugural event’s proceeds. “While highlighting the growing Cambridge restaurant scene, we wanted to include the students who will be employed in the industry soon. RSTA is positioning the students to succeed in an exciting climate for restaurants and hospitality” said David Maher, President and CEO of the Cambridge Chamber. At the high school, the RSTA Culinary Arts students work in a modern, fully-equipped commercial kitchen and dining area called the Falcons' Nest Restaurant. Students rotate weekly through cooking, baking, and restaurant management learning experiences. The program provides students with an intensive, practical application of skills and decision making demanded by the Culinary Arts Industry. Alanna Mallon, Founder of the Cambridge Weekend Backpack Program helped make the connection between the Chamber and the RSTA program. The Weekend Backpack Program provides Cambridge students in need with a backpack of healthy food to ensure their access to nutrition during the weekend, when school meals are not available. The RSTA Culinary students have been longtime volunteers with the program, helping to take inventory and sort the food that ends up in the backpacks.